The Ports of Los Angeles and Long Beach might be some of the world’s busiest shipping facilities, but just beyond the stacks of shipping containers and bustling cranes sit densely populated neighborhoods that have struggled for decades to maintain a vital hold on the nearby waterfront. That dynamic is about to change, as a slew of transformative waterfront-adjacent projects aim to reclaim and transform the shore for nearby communities. Following a new master plan issued in 2014, the waterfront areas along the Port of L.A.–adjacent neighborhood of Wilmington have been in a continual state of restoration and redevelopment. 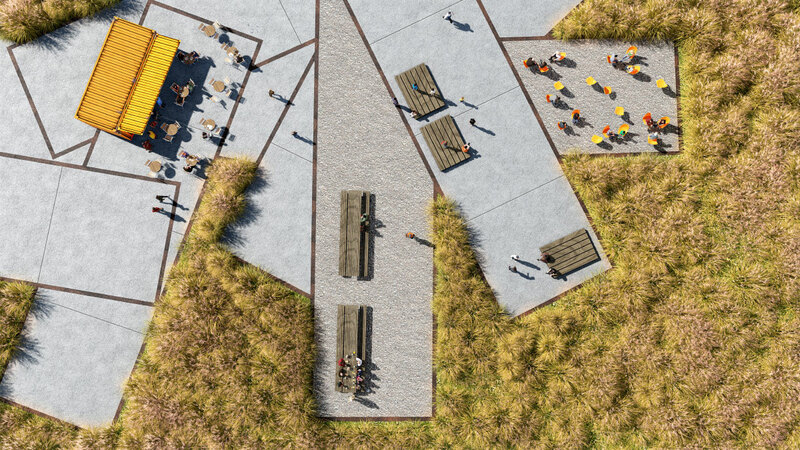 There, Boston-based Sasaki built out the first phase of the Wilmington Waterfront Park in 2012, a 10-acre installation packed with natural berms, playing fields, and trees. The plans—developed with Studio-MLA—would create a “buffer against port operations” and a “window to waterfront,” according to Zach Chrisco, partner in charge of the project at Sasaki. The latest phase of the waterfront redevelopment project aims to recast the existing waterfront areas with more widely accessible leisure and shopping spaces connected by public amenities like a giant lawn, stepped landings that meet the water, a small floating harbor, and a fishing pier. 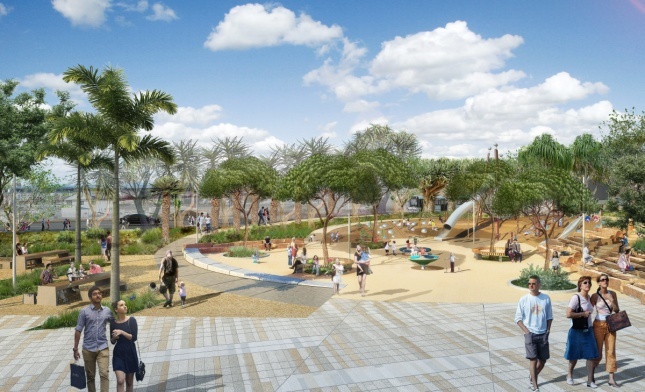 “Our goal with the project is to diversify the way the community can engage with the water,” Kate Tooke, landscape architect at Sasaki, explained, describing the metallic shade structures and an open-floor leisure pier with hammocks that dangle directly over the water. The waterfront will connect to the Wilmington community via the Avalon Promenade and Gateway, a new promenade and pedestrian bridge sequence designed by T.Y. Lin International that will feature underground restrooms on one end and a public plaza on the other. Both projects are slated to break ground this year with an anticipated 2019 opening. 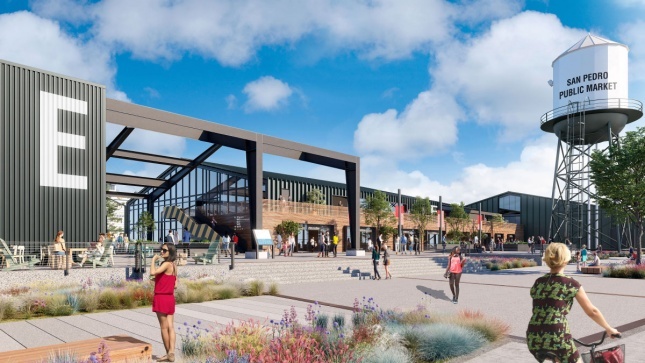 In the nearby neighborhood of San Pedro, developers Ratkovich Company and Jericho are leading the Ports O’ Call Village redevelopment project aimed at bringing a new 180,000-square-foot San Pedro Public Market project to life. The development is led by Rapt Studio, a local design firm. Describing the lead-up to the project, Sam Farhang, Rapt Studio president and project lead said, “We went in immediately and said, ‘This is not a project that could be designed and delivered by single team.’” The designers got to work on assembling a “dream team” for the project that includes James Corner Field Operations and Adamson Associates as executive architects. The project will be delivered in phases through 2020 or 2021 as to not displace some of the larger tenants that will remain. Across one of the shipping channels, Gensler is working toward a long-term vision that would rework the area’s employment and economic demographics, as it builds out the multi-phase AltaSea development; a new 35-acre complex that will combine marine research, public education programs, and sustainable energy development. The $150 million complex will aim to redevelop a series of existing waterfront warehouses, replacing industrial shipping uses with high-tech research equipment and hordes of visiting tourists, school children, and researchers. Work on that project is currently underway and the first phase is expected to be completed in 2023.